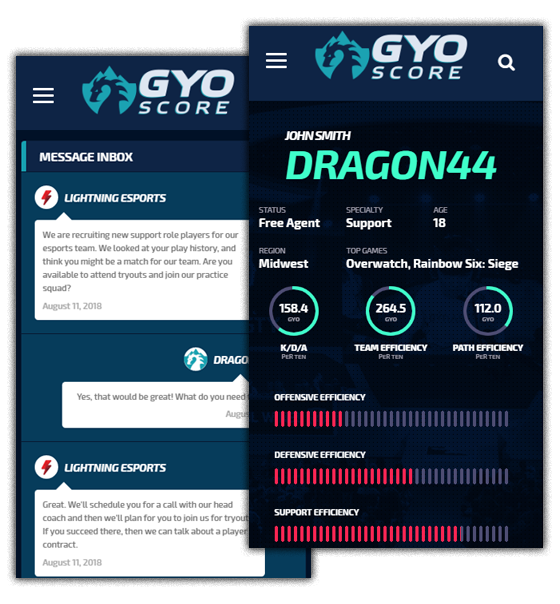 GYO is a scoring algorithm that takes into account personal versus team performance and puts the power back into the player's hands by allowing them to specifically designate the games that matter the most. By joining GYO, you're gaining access to deeper analytics than ever before, and you're putting yourself in front of thousands of colleges recruiters, pro esports scouts, and teams seeking players so that you may one day join the ranks of professional esports stars. Data analytics and sabermetrics for gamers worldwide. A deeper look into standout individual performances that value efforts beyond the basic statistics. Past performance dictates future success. We show you how your gameplay will translate to future titles before they release. We alert you when your stats don't align with expected results, giving you targeted advice for where your game needs improvement. If you opt-in, we will share your data directly with universities, scouts, and pro-esports organizations to help you get discovered. Define. Set Goals. Execute. Dominate. Raw statistics in team games only tell a partial story, and your true skill may be overshadowed by game mechanics and trolls. GYO is here to tell the real story. With most games, your rank lives or dies based on your team's performance. Playing with a toxic troll? Someone on your team lags out? Get paired with a griefer? Regardless of your actual performance, your rank suffers.